50th Anniversary Edition on double SACD! Bespoke 7-inch package includes Flexi Disc! The Rolling Stones Beggars Banquet (50th Anniversary Edition), was recorded between March and July of 1968 at Olympic Sound Studios in London, mixed at Sunset Sound in Los Angeles, Beggars Banquet was the first Stones album produced by Jimmy Miller, and marks the start of what is considered their most prolific album era. Beggars Banquet has a special place in the history of the band, as it is the final album completed with the original lineup of Mick Jagger, Keith Richards, Brian Jones, Bill Wyman, and Charlie Watts. In the August 10, 1968 issue of Rolling Stone, magazine founder and editor Jann Wenner previewed the album for his readers noting, "The Rolling Stones have returned, and they are bringing back rock and roll with them. They have finished their next album — titled Beggars' Banquet — and it is the best record they have yet done. In all aspects it is a great album; great Rolling Stones' material and performance; a great rock and roll album, without pretense, an achievement of significance in both lyrics and music." Wenner also put Mick on the cover of that issue, with a boastful headline, "The Stones Make the Great Comeback of Their Career." Long after its original release, legendary rock journalist and author Ben Fong-Torres heralded Beggars Banquet as "an album flush with masterful and growling instant classics" that "responds more to the chaos of '68 and to themselves than to any fellow artists . . . the mood is one of dissolution and resignation, in the guise of a voice of ambivalent authority." With the 1969 release of Beggars Banquet in Japan, the album included a 7-inch flexi disc capturing a telephone interview between Mick Jagger and a representative of the King Records in Tokyo, the distributor of London Records in Japan. The rare artifact's title translated to "'Hello, This Is Mick Jagger!' LONDON to TOKYO April 17, 1968" and it has been restored and reissued on flexi disc with identical sleeve art. A cunning moment in the exchange was captured over the telephone, halfway around the world, while the band was busy recording the yet-unnamed album Beggars Banquet in Olympic Sound Studios, when Jagger was asked "What do you think is the future direction of your music?" And with no hesitation, he responded "Sideways." 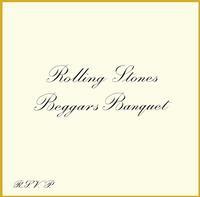 The original intended album cover art for Beggars Banquet was initially rejected both by London Records, their U.S. label as well as Decca, their U.K. label. The Michael Vosse photograph of a vandalized restroom wall (Jagger and Richards provided the graffiti, the restroom was inside a Porsche dealership) was deemed offensive, possibly because the top of an open toilet is captured in the shot. The replacement cover was simply the band name and album title written in the style of a wedding invitation, and remained that way for several years before the intended bathroom photo art was no longer perceived as offensive, and finally gained its rightful place on the cover. This bespoke special SACD edition of the Beggars Banquet 50th Anniversary release, adopted from the special vinyl edition of BB50, is sized to a 7" package. Contains 2 SACDs, Flexi Disc in printed sleve with Mick Jagger phone interview 1968. Printed replica packshots of 2 Japanese 7" single sleeves ("Jumpin' Jack Flash," "Street Fighting Man") and maintains original Japanese wrap in poly bag.